I had the honor of portraying Etta Place in a PBS Movie of the week called Gunfighters of the Southwest/Butch Cassidy & the Sundance Kid. I was working in California at the time when I got a call from a cast director in New mexico, Teresa Neptune with Rainbow Casting Service. Teresa is very well known for casting many of the major films/TV series which were filmed in New Mexico at this time, such as; The Cowboy Way, Buffalo Girls, Lazarus Man, The Hi-Lo Country, All the Pretty Horses and many more. She asked if I was interested in working on this project and if so please be here on this date. 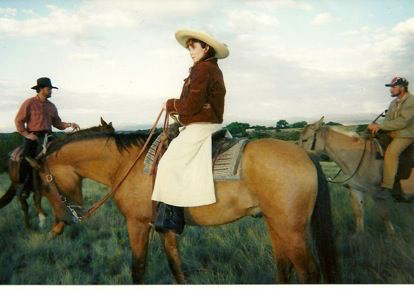 She had casted me for several other projects in the past and knew that I was dependable, knowledgeable, always willing to help out and I could handle horses and ride very well. So in a few days I was working on Butch Cassidy and the Sundance Kid! 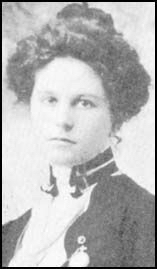 'Etta Place (born c. 1878, date of death unknown) was a companion of the American Outlaws Butch Cassidy (real name Robert LeRoy Parker) and the Sundance Kid (Harry Alonzo Longabaugh), both members of the outlaw gang known as the Wild Bunch. Principally the companion of Longabaugh, little is known about her; both her origins and her fate remain mysterious. Despite Longabaugh and Parker's fame, by the mid-20th century it was the mysterious vanishing of Place that sparked the most interest, which continues to the present day'. After having the wardrobe and the hair & makeup ladies do their magic - I was ready! Everyone was amazing at the shocking resemblance between the "Real" Etta Place and myself, which made me very happy!